Confocal immunofluorescent analysis of mouse hippocampus using NeuN (D4G4O) XP® Rabbit mAb (Alexa Fluor® 647 Conjugate) (red) and GFAP (GA5) Mouse mAb (Alexa Fluor® 488 Conjugate) #3655 (green). Sections are mounted with ProLong® Gold Antifade Reagent with DAPI #8961. 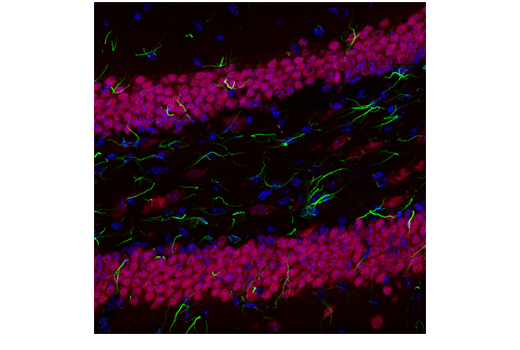 NeuN (D4G4O) XP® Rabbit mAb (Alexa Fluor® 647 Conjugate) recognizes endogenous levels of total NeuN protein. Monoclonal antibody is produced by immunizing animals with recombinant protein specific to the amino terminus of human NeuN protein. This Cell Signaling Technology antibody is conjugated to Alexa Fluor® 647 fluorescent dye and tested in-house for immunofluorescent analysis in mouse tissue. The antibody is expected to exhibit the same species cross-reactivity as the unconjugated NeuN (D4G4O) XP® Rabbit mAb #24307. Neuronal nuclei (NeuN, Fox-3, RBFOX3) is a nuclear protein expressed in most post-mitotic neurons of the central and peripheral nervous systems. NeuN is not detected in Purkinje cells, sympathetic ganglion cells, Cajal-Retzius cells, INL retinal cells, inferior olivary, or dentate nucleus neurons (1). This neuronal protein was originally identified by immunoreactivity with a monoclonal antibody also called NeuN. Using MS-analysis, NeuN was later identified as the Fox-3 gene product. Fox-3 contains an RNA recognition motif and functions as a splicing regulator (2). Fox-3 regulates alternative splicing of NumB, promoting neuronal differentiation during development (3). Mullen, R.J. et al. (1992) Development 116, 201-11. Kim, K.K. et al. (2009) J Biol Chem 284, 31052-61. Kim, K.K. et al. (2013) J Cell Biol 200, 443-58.